I sparged the grain bag in a smaller pot. This is not an article on how to brew the perfect traditional saison, or farmhouse ale. It’s the story of a beer of the moment — an inspiration of improvisation. It has been an embarrassingly long time since I have brewed. So, when the opportunity arose today, I took advantage of it with the ingredients I had on hand. The inspiration for brewing a saison came from two sources. First, our recent trip to Philadelphia included stops at breweries that featured exceptional saison-based beers. Gerard Olson and Daniel Endicott brew beers at Forest and Main in Ambler, Pennsylvania, that are hybrids of English and Belgian styles. Saison yeast is often well featured. Tom Baker of Earth – Bread + Brewery in the Mt. Airy Neighborhood of Philly served us two saison-inspired beers that knocked our socks off. One was infused with generous amounts of American hops. The second reason for my wanting to brew a saison was the fact that a packet of Belle Saison dry yeast from Danstar was included in my goodie bag from the National Homebrewers Conference. Maybe I should have put this reason as the first. From what I can gather from books and online sources, traditional saison recipes start with a base of pilsner malt and often wheat. I had neither in my grain bin this morning when the brewing bug bit. I did, however, have American two-row barley and a bit of malted rye. That would have to do. 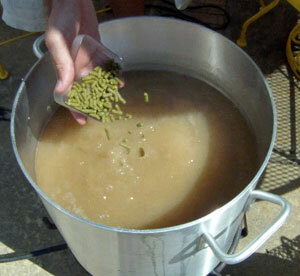 American hops are featured at the end of the boil. 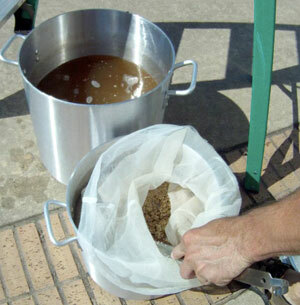 I chose Brew in a Bag (BIAB) as the technique for mashing. I like BIAB for moderate gravity beers. Washing the nylon bag is much easier than washing my cylindrical cooler, and my efficiencies are usually pretty close to more traditional mashing methods. When it comes to higher gravity beers, I go back to the mash tun. Picking up a bag full of fifteen pounds of saturated grain, for example gets a bit more tricky. For the hops, I laid a base bitterness with Hallertau pellets. I went American with the late addition hops, choosing Amarillo for a five-minute addition and Mosaic for the end of the boil. I believe the fruity character of the American hops will compliment the spices that I hope to get from the saison yeast. Using the BIAB technique, I added the grain to 6 gallons (23 Liters) water at 159˚F (70.5˚C) in my brew kettle that was lined with a nylon mesh bag. This gave me a mash rest temperature of 151˚F (66˚C), which I held for 60 minutes. After removing the bag of grain from the kettle, I sparged it in a second kettle that held 1.5 gallons (5.7 liters) of water at 170˚F (77˚C). This gave me a wort with the pre-boil volume of almost 7 gallons (26.5 liters). After establishing the boil, I added the Hallertau hops and set my timer for an hour. Five minutes before the end of the hour, I added the Amarillo hops, followed five minutes later by the Mosaic hops and flameout. I hydrated the dry yeast in a small volume of boiled and cooled water before adding to the chilled wort in the fermenter. I shook the carboy vigorously for two minutes to aerate. James, sounds like a great recipe. I made a saison last spring using the Belle Saison, and the beer is delicious. I late hopped with Falconer’s Flight, used Delta for the rest. I think you’ll like that yeast. It came out with a nice spice, citrus balance, and quite dry. They Belle Saison is shown as high attenuating, and in my case, they weren’t kidding. Thanks, Rick. That does sound tasty. The airlock is smelling really good right now – spice from the yeast and fruit from the hops. I can’t wait until it’s ready to taste. I love the spirirt of saisons and the opportunity for creativity they allow. This yeast as well as Wyeast 3711 French Saison (which is extremely similar if not the same strain) are a joy to brew with and I think you’ll really like the result. Your recipe looks great. Please let us know how it turns out. Thanks. I’ll update when it’s ready. I’m now debating whether to rack to secondary or let it stay in the primary for another week. This is pretty much exactly what I am going to do this week. I have the yeast from NHC and some pale malt and malted wheat sitting around so I am going to see what happens. The saison article in Zymurgy in May/June 2008 has a recipe for a fall saison made with Maris Otter and an option for adding pumpkin to the mash. I’m tempted to try that version also. That sounds like fun. I racked my saison to the secondary yesterday, and it smells delicious. Lots of citrus and tropical fruit. It tasted a bit yeasty yet, but that will clear, I’m sure. Can’t wait. James- I took an equally independent path in brewing a farmhouse ale. I had recently done a classic Siason (which turned out splendidly), and harvested some of the yeast. Next up in my brewing rotation was a Cal Common. The grain bill of 2 row, Munich and Crystal looked interestingly parallel to the saison. I upped the boil volume for 8 (finished) gallons and adjusted the grain. Mashed at 152* (BIAB) and started the boil. Bittered with Nugget at 60 minutes. At 15 minutes I transferred 4 gallons to another brew kettle and finished the Cal with Northern Brewer hops (fermented with Wyeast 2112 as usual OG 1.052, FG 1.012). The second portion of the wort was brought to a boil and hopped with Willamette and Vanguard and fermented with the harvested Wyeast 3711(OG 1.052, FG 1.002). Results was amazing. Certainly has the tart/pepper character of a saison, but the malt backbone of 2 row instead of the traditional. pilsner. Served it at a tailgate party, and the consensus was that people liked it as well as the Cal Common (which is a consistent medal winner for me). Here’s to experimenting with your brewing! Very cool! I love split batch experiments. Thanks for the details. One late additional note: I Entered the Farmhouse Ale described above the Grandbrew Fest last fall and took 3rd place overall. Experiments do pay off!